There's so much subtleness and harmony to be found in the aromatic Haramain Naeem that it's not hard to imagine as the driving force behind your spiritual well-being. With this refreshingly keen fragrance in tow, divine moments and constant clarity come easy, and such characteristics facilitate opening of the golden gates to peace. This product is excellent fresh notes definitely smells green the hint of amber! Wow! Just WOW! 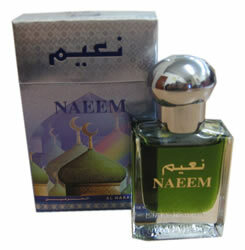 Naeem, like many Al Haramain products, goes on extremely powerful, but the transition into the dry-down leaves a profoundly clean green scent, like scrubbed-soapy clean, or a very high-end, triple-milled soap. In fact, wear this and people will simply believe you're fresh from the shower! Great stuff!